There are certain times of the day when the Purdue sports facilities just shine. I love being at Folk Field as the sun is going down. The basketball arena here looks best at blue hour usually. 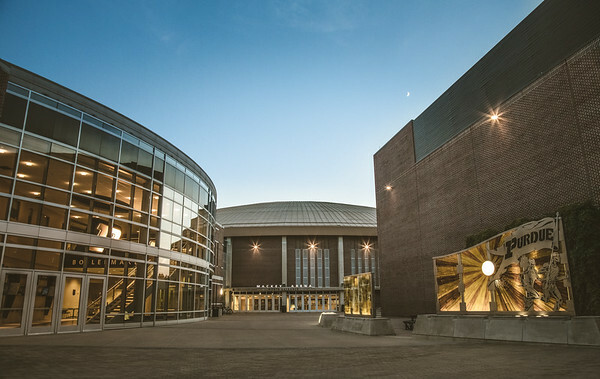 Here just after the sunset Mackey Arena looks pretty good. I think it is the hue of the lights and the way that they play with the blue sky that make it great for me. I made this on one of my Purdue photo walks a couple of years ago. We are nearly two months into the year, and I have yet to do that this year. That might have to change soon. Tonight is a big game for the Purdue basketball team. They have had a great season, but lately things have not been going their way. The good news is that the we are not into March yet. When this team is firing on all cylinders they can do anything that they want to do. Tonight will be the first step in what should be an amazing finish to this season.